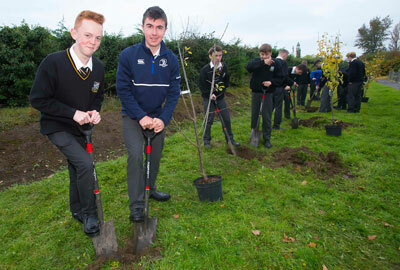 We are looking for a sponsor to work with us in providing 100 orchards to community groups all over Ireland. At 11am on Saturday 26th November 2016 a legacy of 100 orchards were created all over Ireland. In just one hour a hundred gorgeous growing spaces for a hundred communities were created. 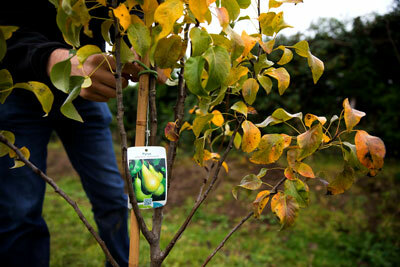 100 starter orchard packs were provided FREE to give to 100 food growing and community groups across Ireland. Orchard in an Hour 2016 was a tremendous success with 100 packs of 2 apple, 2 pear and 1 plum trees being sent out all over the country and bringing communities together to plant orchards. These trees will provide fruit and increase biodiversity into the future. We are currently looking for a sponsor to bring Orchard in an Hour to another 100 communities around the island of Ireland. When we do find a sponsor we will be looking for applications from communities that would like to create orchards up and down the country. You could be an existing GIY group or growing food in a school. Maybe you are on the Tidy Towns committee or starting a Men’s Shed? Perhaps you are living in Direct Provision or attending a Rehabilitation Centre. Or have you always fancied a little positive rebellion with a spot of guerrilla gardening? Then this is for you. Orchards are amazing places. They look and smell wonderful. They are a source of local, seasonal and chemical free healthy food. They are also hugely beneficial to the environment, supporting insects, birds and lots of other wildlife. 100 Orchards are an amazing legacy of health, life, productivity and vitality. The orchard packs will be sent out, completely free of charge, to 100 communities across Ireland who will all plant them at the same time, on the same day. At a certain time on a certain date, there will be hundreds of you up and down the country planting your orchards in an hour. We want to see you all planting together. Post your pics, before and after on Facebook, tweet about the teas and tarts, take sowing selfies, or video your group. Use the hashtag #OrchardInAnHour to be in with a chance to win €100 voucher for the GIY Shop. The winning group can use their voucher to buy tools, seeds, books or even another orchard starter pack! We are proud to work with sponsors in the future to create more Orchards in an Hour, creating a legacy of food growing for 100 communities for the next 100 years and beyond. 100 orchards, 100 communities, 500 trees, 60 minutes and you. If an apple a day keeps the doctor away, imagine what 100 Orchards in an Hour can do. The trees are designated for community groups, not for private individuals, even if they would be a lovely addition to the back garden, you’ll have to invest in an orchard pack. Only one pack per applicant and per group, let’s all share the love and let everyone benefit. The trees should to be planted in a public space for all to enjoy, don’t go hiding your lovely pears. Packs will be allocated by GIY to ensure a fair distribution, both geographically and between different types of groups. They can’t all go to Salsa for over Sixties in Sligo for example. GIY’s decision on pack allocation is final, these are free gifts from us and sponsors to the country, there’s no constitutional right to freedom of trees.